Dry. Prairies, fields, open woods, roadsides. Sandy soils. This is a 24″ to 6″ tall, erect, perennial forb that rises usually on a solitary stem from a woody, branched, ascending rootstock. The most striking feature of this plant are the long hairs on the stem and leaves. The stems are erect or strongly ascending, stout, finely ridged, and unbranched below the inflorescence. They are hairy with up to three types of hairs. 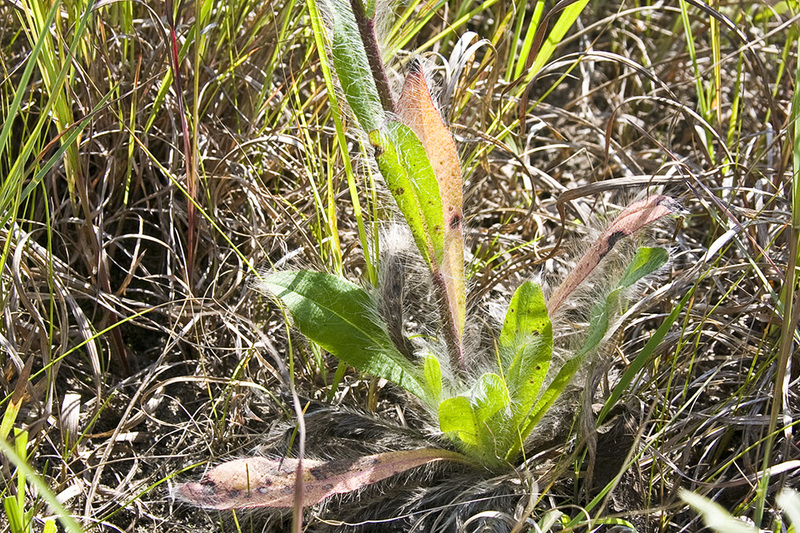 The base of the stem is densely covered with ¼″ to ⅝″ long, white to light orangish-brown, spreading to loosely ascending hairs. 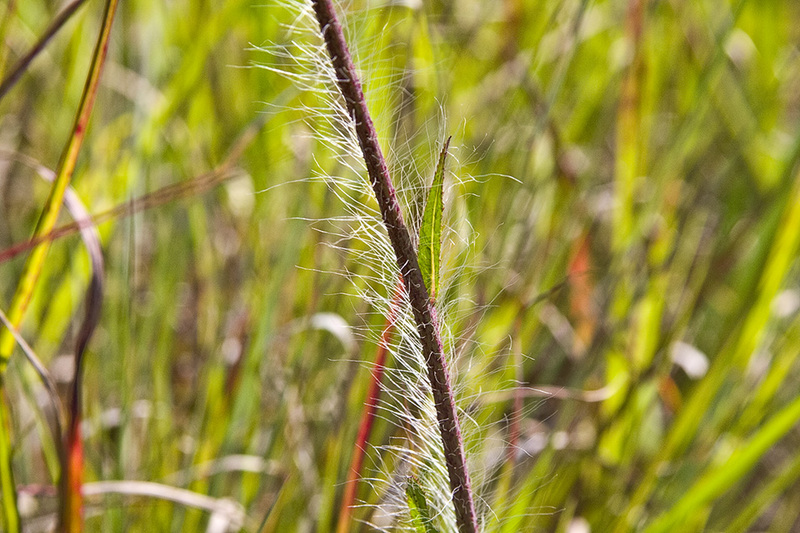 These hairs become shorter and sparser as they ascend the stem, the hairs on the upper stem ⅛″ to ⅜″ long. 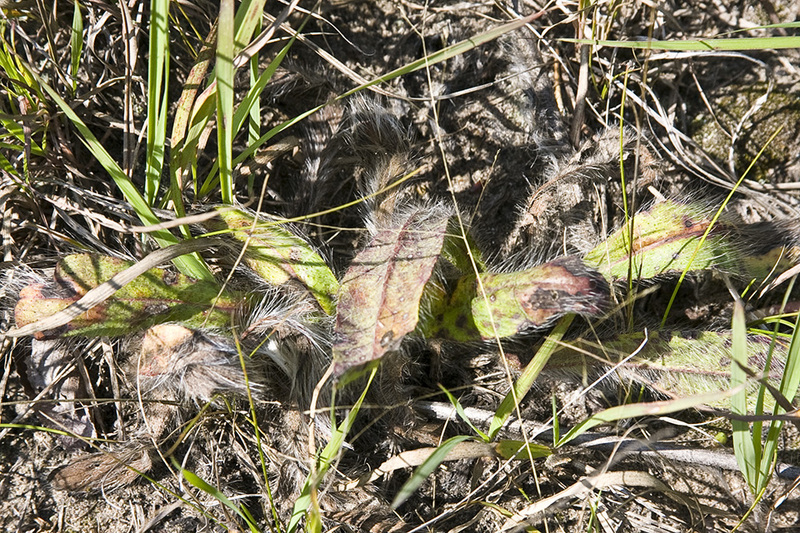 The stems are usually also covered with minute, soft, star-shaped hairs. 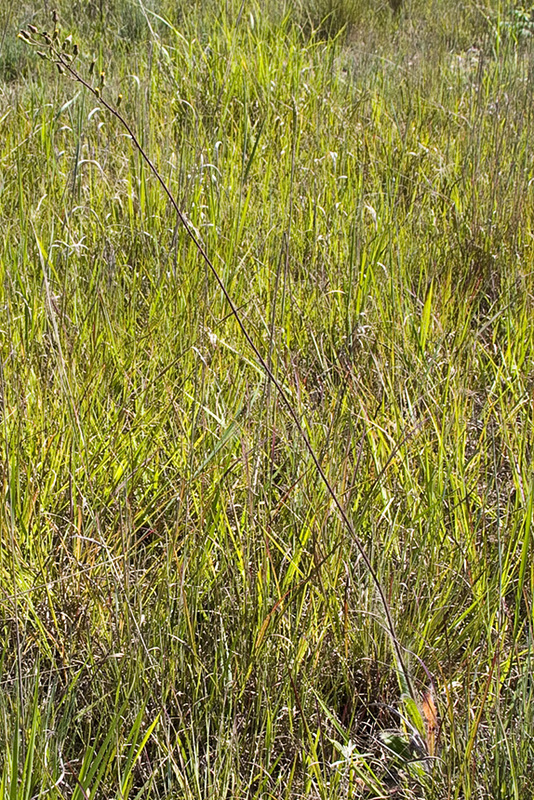 Finally, the stems are often sparsely covered with gland-tipped hairs toward the top. There are usually 3 to 8 or more basal leaves and 6 to 12 stem leaves. Basal leaves are inversely lance-shaped, short-stalked, unlobed, wedge-shaped at the base, and rounded to sharply pointed at the tip. They can be 1¾″ to 10″ or more long and ½″ to 19 ⁄16″ wide, though they are usually no more than 3⅛″ long and 13 ⁄16″ wide. They are 4 to 7 or more times as long as wide. The upper and lower surfaces are densely covered with ⅛″ to 5 ⁄16″ long or longer, more or less spreading hairs. The margins are untoothed and have a fringe of long, straight hairs. Basal leaves are often present at flowering time. Stem leaves are similar to basal leaves but are mostly stalkless and are gradually reduced in size as they ascend the stem. The base of the leaf does not clasp the stem. Stem leaves are mostly confined to the lower half of the stem, and are often crowded near the base. If there are leaves on the upper half of the stem, they will be small and bract-like. The inflorescence is a cylinder-shaped, branched cluster (panicle) of 10 to 20 or more flower heads at the end of the stem. Sometimes the inflorescence is unbranched and spike-like. 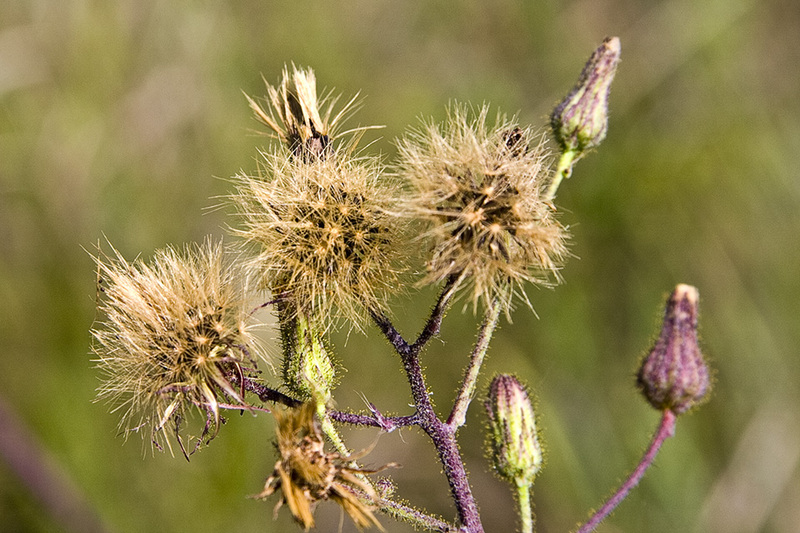 The flower heads are on short stalks that have minute, star-shaped hairs, glandular hairs, and sometimes also long straight hairs. The flower heads are ½″ to ¾″ wide. The whorl of bracts at the base of the flower head (involucre) is bell-shaped and ¼″ to ⅜″ long. 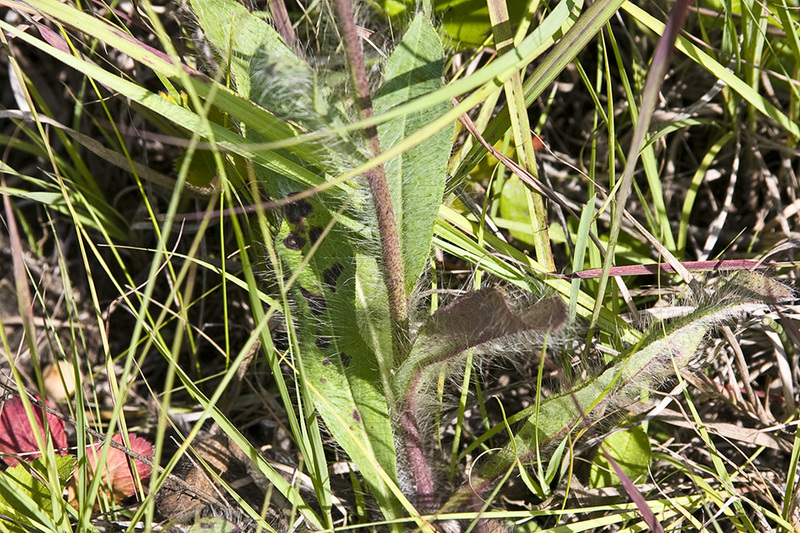 The bracts of the involucre are covered with minute, star-shaped hairs and longer, dark-colored, gland-tipped hairs. Each flower head has 30 to 60, though usually no more than 40, yellow ray florets and no disk florets. The fruit is a ⅛″ to 3 ⁄16″ long, urn-shaped achene with 35 to 40 or more straw-colored to orangish-brown bristles attached to the end. 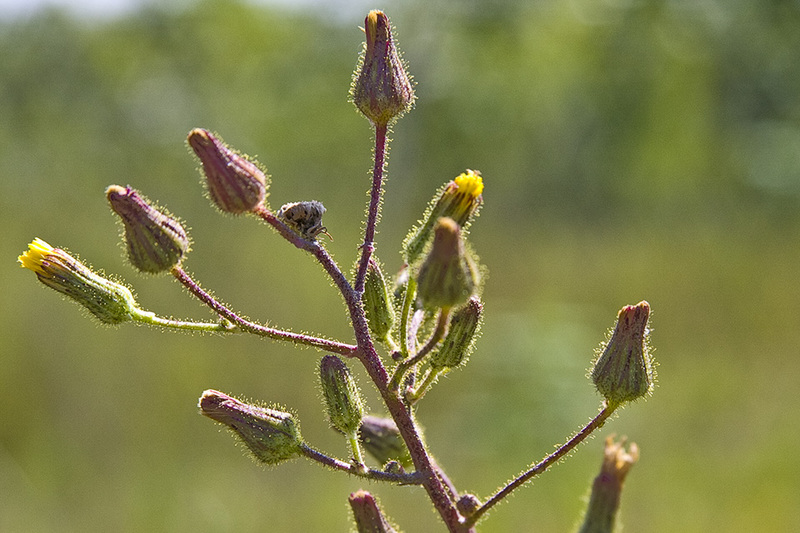 The long hairs on the stem and leaves distinguish this plant from all other hawkweeds found in Minnesota. South-facing bluff, in bluff prairie.